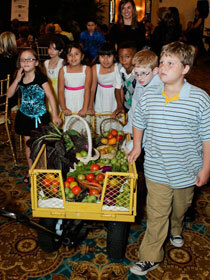 PALM BEACH, FL – As they pulled a wagon filled with vegetables into the stately room at The Breakers, the kids made their point: The Palm Healthcare Foundation works. The demonstration by students of Berkshire Elementary School was part of the Palm Healthcare Foundation’s 10th anniversary celebration. More than 120 supporters attended the program, sponsored by Gunster. Since it was chartered in 2001, the foundation has distributed $45 million to more than 95 non-profit organizations in Palm Beach County, operating over 130 programs. The Berkshire kids reminded guests that their homegrown healthy foods were made possible by the foundation’s funding of the Robert Wood Johnson Foundation Healthy Kids, Healthy Communities project. Bill Perry, of Gunster, the foundation’s chief executive officer, delivered remarks to the guests, followed by representatives from 10 Palm Beach County nonprofit groups who shared their stories about the Palm Healthcare Foundation’s role in their organizations’ success. Some of the participating groups included the Healthcare Emergency Response Coalition, JFK Medical Center, the Mental Health Association, Area Agency on Aging, Caridad and Genesis Community Health Centers, and the FAU Diabetes Education and Research Center. Among those who attended the program Feb. 1 were Lew Crippen; Hermé de Wyman Miro; Mark Cook, vice chair of the Palm Healthcare Foundation; Dr. David Dodson, a trustee of the foundation; Donna Ross; Joe and Mary Ierardi; Dr. Michael Dennis; David B. Robb, founding board chair of the foundation; Dan Hanley; Kevin Lamb; Mike Mitrione; Bill Hennessey; and Dr. Ahmad and Cherie Toufanian. For more information on the foundation, visit www.palmhealthcare.org or call (561) 837-2278.